Esmaeelzadeh, F., Kamyabi Gol, R., Raisi Tousi, R. (2014). A Class of compact operators on homogeneous spaces. Sahand Communications in Mathematical Analysis, 01(2), 39-45. Fatemah Esmaeelzadeh; Rajab Ali Kamyabi Gol; Reihaneh Raisi Tousi. "A Class of compact operators on homogeneous spaces". 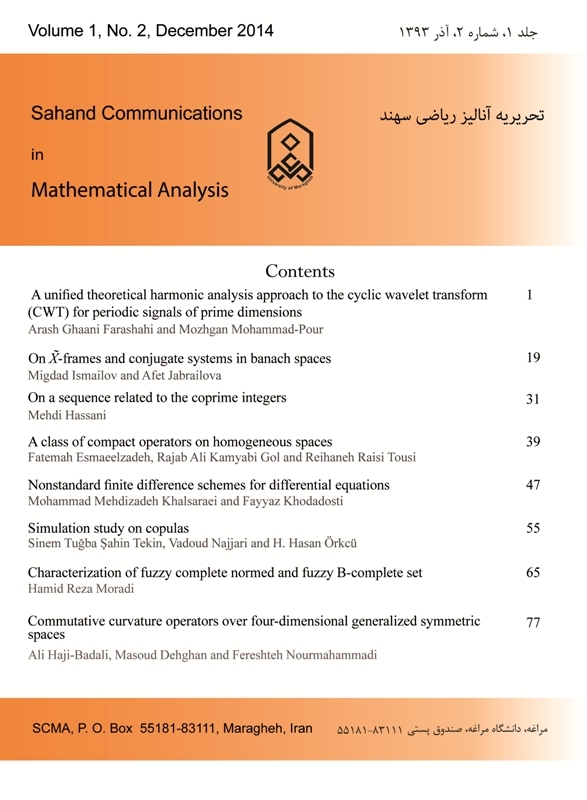 Sahand Communications in Mathematical Analysis, 01, 2, 2014, 39-45. Esmaeelzadeh, F., Kamyabi Gol, R., Raisi Tousi, R. (2014). 'A Class of compact operators on homogeneous spaces', Sahand Communications in Mathematical Analysis, 01(2), pp. 39-45. Esmaeelzadeh, F., Kamyabi Gol, R., Raisi Tousi, R. A Class of compact operators on homogeneous spaces. Sahand Communications in Mathematical Analysis, 2014; 01(2): 39-45. 1Department of Mathematics, Bojnourd Branch, Islamic Azad University, Bojnourd, Iran. 2Department of Mathematics, Center of Excellency in Analysis on Algebraic Structures(CEAAS), Ferdowsi University of Mashhad, P. O. Box 1159, Mashhad 91775, Iran. 3Department of Mathematics, Ferdowsi University of Mashhad, P. O. Box 1159, Mashhad 91775, Iran. Let $\varpi$ be a representation of the homogeneous space $G/H$, where $G$ be a locally compact group and $H$ be a compact subgroup of $G$. For an admissible wavelet $\zeta$ for $\varpi$ and $\psi \in L^p(G/H),\ \ 1\leq p <\infty$, we determine a class of bounded compact operators which are related to continuous wavelet transforms on homogeneous spaces and they are called localization operators. S. T. Ali, J-P. Antoine and J-P. Gazeau, Coherent States, Wavelets and Their Generalizations, Springer-Verlag, New York, 2000. F. Esmaeelzadeh, R. A. Kamyabi Gol and R. Raisi Tousi , On the continuous wavelet transform on homogeneous spases, Int. J. Wavelets. Multiresolut, Vol. 10, No. 4 (2012). G. B. Folland, A Course in Abstract Harmonic Analysis, CRC Press, 1995. K. Zhu, Operator Theory in Function Spaces, Mathematical Surveys and Monographs, Vol. 138, 2007. M. W. Wong, Wavelet Transform and Localization Operators. Birkhauser Verlag, Basel-Boston-Berlin, 2002.